That application is now ready. If you want to give it a try, download it from following links. The application is about 21 MB in size. JRE is not packaged in the above application. You will have to download and install it, if you don’t have it already. It provides a container to run web applications as standalone desktop apps. It does not bundle any web browser, but uses IE browser on Windows and Safari on Mac. Manifest-Version – This is required. Application-Name – Its value appears in the title bar. Window-Width – Width of application window. Window-Height – Height of application window. Show-Menubar – true/false. 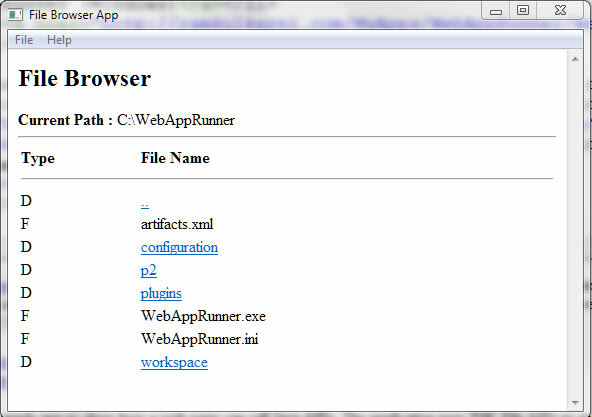 Specify if menus (and hence menu bar) of WebAppRunner be displayed when the application is opened. The primary use case is to create desktop standalone applications, even if they don’t need web interface. It is easy to create powerful UI with HTML,JS and CSS. The main application logic can be in a jar packaged with your app. Or you can build complete standalone HTML5 application using local DB storage feature that uses SQLite/IndexDB. You can also use it as a wapper for you existing browser based web apps, which can be enhanced by allowing access to local resources e.g. allowing (of course, trusted) web application to search files on your local disk. createJava: For creating a new Java object. Returns : Name of the variable (sent as the last argument) , if Object is created successfully, else returns null. The first argument is variable name, returned by createJava function described above. The last argument is return variable name. Evan if method does not return anything (void), you have to pass the last argument. It could be null for void methods. Returns:Only basic data types e.g. String, numbers (int, float, double etc.) and boolean. Any other Java object is stored in a variable passed as the last argument. Note that if the Java method returns one of the basic data types, then executeJava returns the same and no return variable is created even if you specify valid variable name in the last argument. var fileList = executeJava(“fileObj”, “listFiles”, “fileList”); //calls listFiles method on fileObj, which is of type java.io.File, and is created using createJava method. Third argument is return variable name. It is required, but can be null. See description of executeJava for more details. Returns : Value of the field/property in the given Java object. See return value description of executeJava above for more information. Third argument is return variable name. It is required, but can be null.See description of executeJava above for more details. Returns: Object at given index in the array. See return value description of executeJava above for more information. executeStaticJava : For calling static methods. getApplicationPath: For getting path of the curently opened application with”Open File” or “Open Folder” method. This is useful when application is packaged as a zip and opened with WebAppRunner. Applications in Zip files are unzipped in a temporary folder before executing them. One of the usecase for getApplicationPath is that application is packaged as a zip file and you want to save application specific preferences in a property file in the same folder as the zip. With this API, you can get path of the folder where application zip file exists. exitWebAppRunner: For closing WebAppRunner. Does not ask for the confirmation. Checkout FileAPIs.js in the FileListApp and emp.js in SQLiteApp to see how above APIs can be used in a HTML/JS application. You can pass folder path or zip file path as argument to WebAppRunner. You can also use ‘Open File’ and ‘Open Folder’ options under File menu if you want to load application when WebAppRunner is already opened. I have uploaded 32bit version of this application. This should work on WinXP. I am trying to start WebAppRunner.app with an argument to start my html file with terminal on macosx! How has the argument to look like to start the html file? The argument should be path to a folder. WebAppRunner looks for index.html in that folder and it opens that. So make sure the you have index.html as the first page of your web app. Very good application. One question can we do database connection with our web application through java jdbc api? You need to create a Java class that connects to database using JDBC APIs, package it in a jar and then call it from HTML. Take a look at “Developing Database Applications with WebAppRunner” post. One more question. Means we donot require any web server like tomcat apache etc? Yes, you do not need web server in this application. This looks great. I have one question How would launch a specific folder in WebappRunner using the command line or command prompt? If you pass the folder path as command line argument to WebAppRunner then it should open application in that folder. Hi Ram, could you please give me an example? The argument can be folder path or a zip file. I am not sure if this is what you were looking for. that works great on windows but how about mac I can’t get get it to open using the mac equivelant open -a WebAppRunner.app “path to app” do have any ideas for that? It seems you are using Jetty as the web server. So I assume this can run WAR files and Servlets. But your explanation in this page seems to be assuming that the app is a simple HTML+JS app. Is it possible to deploy a WAR file? If yes, how? Then ti would also need to force waiting the load of the index.html until the WAR is deployed. Yes I used Jetty web server. I used it only as web server and not servlet container. In the present form, you cannot deploy war in this application. I did not see any need to support war deployment. But i try to figuring out how to really hide the toolbar. I have the following config. I understand from your text that the last rule in config does hide the Menubar like “File” and “Help”. Or does it do not ? Yes, setting Show-Menubar to false should hide the menu bar and hence items. I have created SQLiteApp demo, which hides the menu bar.